With my "outdoors" trip reports - especially the ones involving any sort of extra physical challenge or technical ability - there was inevitably a section describing preparations. Going to the Adirondacks on weekends, setting up ropes in the backyard or on a local snow-covered hill. Doing laps of the nearby Dunton Tower's stairwell with 40 pounds of water strapped to our backs. You'd think for a trip report about picking up a car, that wouldn't be the case. As it turns out (at least for me), you'd be wrong. In a few very specific ways Luke and I needed to prep and train. 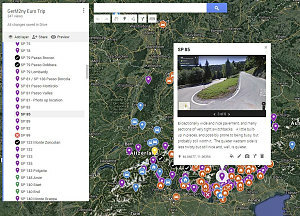 I wanted to minimize the amount the of time that we searched for the really good twisty roads, so I spent quite a lot of time carefully examining - at a close-up scale - maps and street-view images of all of the interesting-looking roads, and cataloging them. I had hundreds documented and imaged by the time of our trip. Next, I wanted to capture this special trip from as many angles as possible - inside the car, outside the car, from the side of the road, from the air. 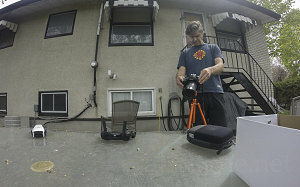 Luke and I spent several weekends working out the kinks with capturing and synchronizing all of the types of footage we'd be gathering. We also spent considerable effort planning for how we'd organize, charge, and access all of these bits of gear during each day of driving. Finally, there was the matter of the Nurburgring. Specifically, the Nordschleife loop - the longest and most famous of the world's race circuits, located in the Eifel Hills of northwestern Germany. It's known as the "Green Hell" - a term coined by British Formula 1 driver Jackie Stewart - and which of course has scary connotations. We planned to drive on the Green Hell, there was no question about it (Luke and I had put this track on our bucket list long ago). With upwards of eighty corners, several of which are high-speed and tricky, we wanted to be ready. Really, really ready. 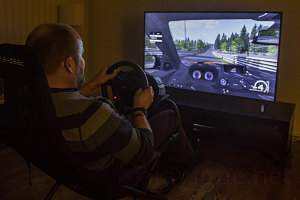 So, Luke and I purchased simulator setups, and from January until our departure at the end of May, we regularly practiced laps of the Nordschleife, often with vehicles that most closely matched the M2. Gradually, ever so gradually, we were able to predict what each upcoming turn was, to know what line to take even before seeing it. By the time May rolled around, I was able to sit with eyes closed and envision a complete lap in my mind (and I assume Luke had reached the same level). All of this of course wouldn't guarantee that we'd be fast - but it would mean that we would not be taken off guard by what was beyond a blind crest or with confusing two similarly-arranged corners from one another.